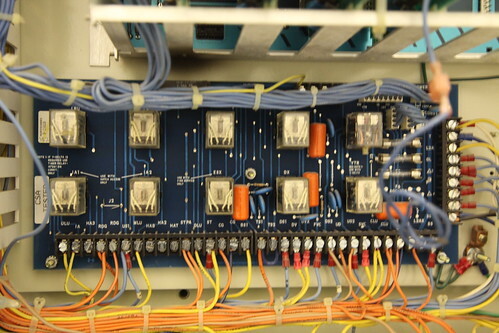 A fairly clean wiring and bundling job, besides the one out-of-focus blue wire that hangs loosely, unconnected. It was apparently a jumper to ground, used for troubleshooting. However, it is extremely unsafe to leave wire jumpers installed. Then again elevator machine rooms and equipment cabinets must be locked at all times, and this also was unlocked. This is a recipe for disaster.